There's nothing as comforting as clay pot rice. Its meaty, mushroomy aroma is irresistible on a cold, chilly night. But, clay pot rice takes a great deal of attention and time to ensure you don't end up with a burnt or soggy mess. So a silicone steamer is a great substitute! Of course, you won't always get the same breadth of flavor and texture as with a genuine clay pot (no crunchy rice bits), but it's definitely a worthy sacrifice when you're in a pinch! 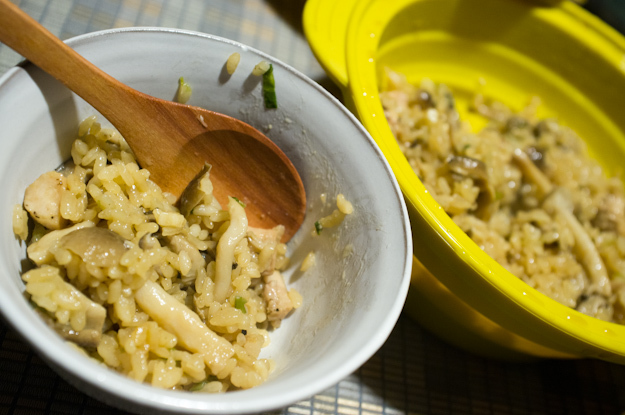 Just combine all the ingredients and stick it in the microwave, and voila--"Clay pot" rice in less than 15 minutes! In a bowl, rinse rice and drain. Combine the rest of the ingredients into the bowl and pour everything into the silicone pot. Place lid on pot and stick it in the microwave. At 800W, microwave on high for approximately 13 minutes. Let pot sit covered for another minute. Microwaves have different wattages and require different cooking times. For every 100W difference, +/- approximately one minute. Different ingredients may also have different time requirements--experiment for the best results!